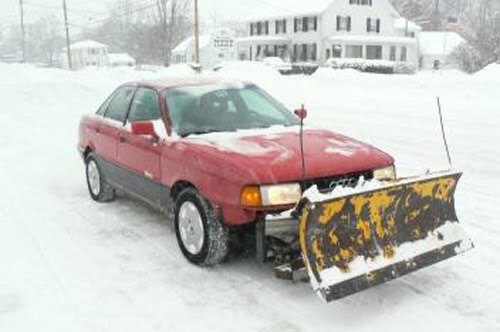 Video: Audi 90 quattro with snow plow becomes "The Plaudi"
As most of you know, throughout the winter, YouTube becomes ripe with videos of quattro-driven Audis performing all sorts of acrobatics in the snow. But this video, oddly uploaded during the dog days of summer, really raises the bar. Using what they call "The Plaudi," check out how the crew at New Hampshire's Bavarian Turbo Tecnics plow their driveway.